A flight of B-24 Liberators of the 446th Bomb Group fly in formation above the clouds. A P-51 Mustang of the 352nd Fighter Group, 487th Fighter Squadron, coded HO-G, "Lilli Marlene", s/n 43-7139, Pilot Lt Cyrus Greer flies over French countryside in Hall 1944 in an image taken by an aircraft of the 446th Bomb Group. Handwritten caption on reverse of print: 'Over France? 9/44 taken by 446BG, 352FG or 359FG'. N.B. This aircraft never flew with the 359th Fighter Group. A formation of B-24 Liberators of the 446th Bomb Group led by a pathfinder Liberator during a mission. 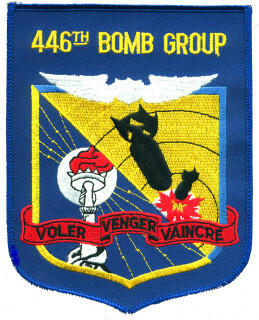 The 446th Bomb Group, who came to be known as "the Bungay Buckaroos" after the name of their Suffolk base, flew B-24 Liberators on strategic, support and interdictory missions over Europe. The Group led the Eighth Air Force and 2nd Bomb Division on the first heavy bomber mission on D-Day, 6 June 1944, and continued to support the ground forces move eastwards, dropping airborne troops into Wesel, north-west Germany, as part of the advance across the River Rhine. The Story of the 446th Bomb Group -Edited by Edward H. Castens.